Mindfulness is always mindfulness of something. Mindful breathing, mindful walking, mindful eating, mindful washing the dishes… In fact it’s possible to make all our activities a mindfulness practice. So why not a mindful of Christmas card writing? Apparently sending Christmas cards is on the decline and has been for some time… maybe something to do with the price of stamps Royal Mail! But the cost of a stamp aside – it is lovely to give and receive a card. When you receive a card you have a reassurance that this person has been thinking of you, has taken the time to write a few lines, cares. They also make nice festive decorations! At Christmas time we are reminded to think of others, to check on elderly neighbours and relatives, sending a card is another way to do this. A recent survey by An Post showed that only 5% people want to receive an eCard or text message saying Happy Christmas. And not everyone lives on social media! To receive a card, a physical thing you can touch and feel and even keep really does have more meaning. I’m sure I’m not the only person who has kept special cards over the years? It can be a really lovely thing to do – to pause for a moment, think of someone and take the time to actually handwrite a card. 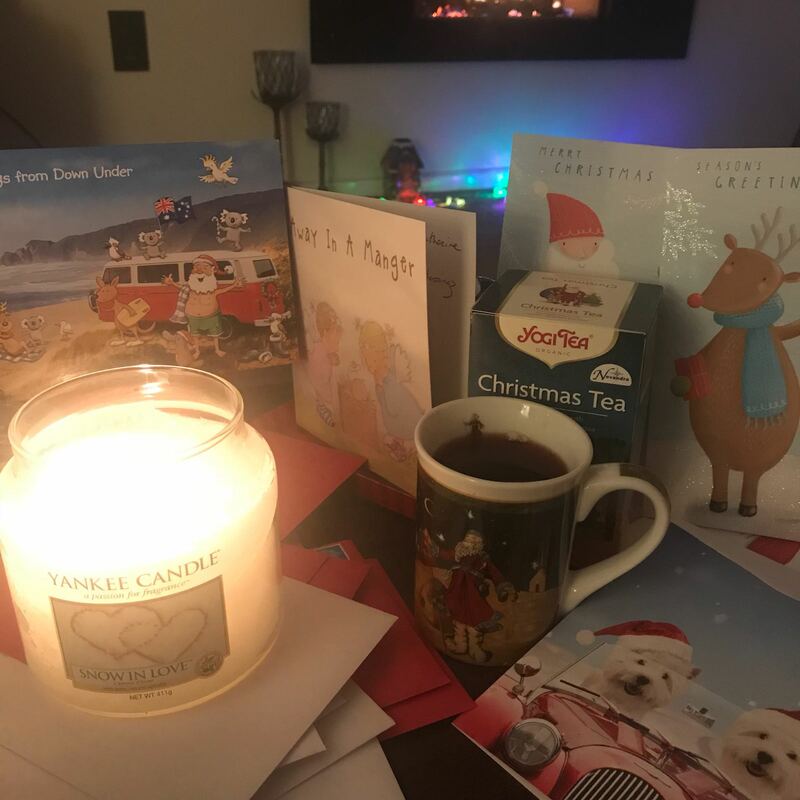 Writing a Christmas cards also gives us time to pause and reflect on the year gone by. To look for the good, the people who have touched us and those we have lost, maybe even those who have moved to other countries who we won’t see so often but you can still communicate with. So if you haven’t written any cards this year – it’s not too late! The last posting day for 2nd class stamps is Tuesday 18 December 2018. Christmas cards are going half price in lots shops too– even better if you get charity ones! So get cosy, make a cup of tea and even a mince pie and then write a list or just think in your minds eye of all the people you would like to send some love to. All the people who have helped you this year or the people who you haven’t seen for various reasons but you want them to know you haven’t forgotten them. Take mindful walk in the crisp winter air to the Post Office (or local shop with a Post Office in it! ), chat to the staff on the counter – spread some Christmas Cheer! When you receive a card in return (though we don’t send to receive – the other person may be too busy or unable to send a card, this is a practice of generosity, just sending for the good of it) take a pause to breath, enjoy and receive the good that has come your way. The neuroscientist Rick Hanson teaches us that the more times throughout the day that we can pause and ‘take in the good’ the more we re-wire our brain towards happiness and contentment. A Christmas card is only a small thing but it comes with a big intention and a wish for your happiness. Allow yourself some gratitude that someone has taken the time and effort to think of you. Receive it, believe it and enjoy this special time of year.